A non-partisan organization led by State Comptroller Susana A. Mendoza, State Sen. Melinda Bush (31st District, Grayslake) and State Rep. Carol Ammons (103rd District, Champaign), the Panel sent its report to Democratic, Green, Libertarian, and Republican party leaders at the state and county level as well as all statewide and state-level campaigns registered with the State Board of Elections. Some of the highlights of the Panel’s recommendations include: tie party funding and resources to campaigns adopting policies and participating in anti-harassment training; create an independent body that is independent from party leadership to receive complaints of sexual-harassment within the parties and on campaigns; and a commitment by each party to put forth resources in the form of dollars and staff to intentionally recruit and support women to win 50 percent of elected offices across state, county and municipal offices, and move more women into leadership positions throughout political organizations and campaigns. Last July, the panel hosted six listening sessions in cities across Illinois to gather feedback and input from women of all political persuasions who work or once worked in politics to help inform the outcome and recommendations of this report. The listening tour included: Urbana-Champaign; Chicago; Rockford; Edwardsville; Springfield; and Carbondale. Hundreds of women ultimately participated in this process. “Sexual harassment doesn’t discriminate by industry, workplace, title or political party. 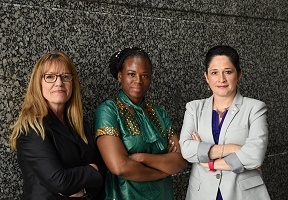 It’s on all of us to create workspaces where women are safe and empowered to lead,” said Tina Tchen, legal counsel to the Illinois Anti-Harassment, Equality and Access (AHEA) Panel. “Navigating gender issues in the workplace isn’t always easy and our existing tools and laws do not fully address these issues. I’m hopeful this new roadmap will give campaign leadership the tools they need to get it right, and help create an environment where women are not only supported in the workplace, but are also met with dignity, respect and the resources they need to lead or run for public office. I hope this report will serve as a stepping stone in moving Illinois forward.” For more information, visit www.AHEApanel.org. (Left to right) State Sen. Melinda Bush (31st District, Grayslake), State Rep. Carol Ammons (103rd District, Champaign-Urbana), and Comptroller Susana A. Mendoza.